omigawa Seikei was a Ryūkyūan politician who became one of the last sanshikan (minister) of the royal government of the Ryūkyū Kingdom in 1875. 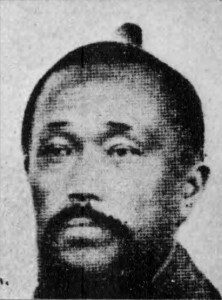 With the abolition of the kingdom in 1879 he first acted as an adviser of the new prefectural government, however, in 1882 he left Okinawa for China as an exile. Tomigawa was a central person in the opposition movement against the Japanese takeover of Ryūkyu. With the Ryūkyūkan – i.e the former center of trading and diplomacy located in Fuzhou, China – as their center of activity, he gathered there with Kōchi Uēkata Chōjō and many other high ranking members of the Ryūkyuan gentry. 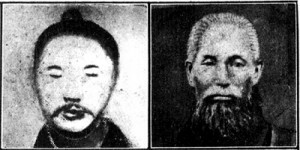 They delivered petitions to the Chinese Qing government for help in restoration of the Ryukyu Kingdom, going as far as requesting military intervention. As they supported military intervention of China against Japan in the Ryūkyū question, they posed a direct threat for Japan. They also ran dōjō in Fuzhou and furthermore exiles would not only return to Okinawa prefecture and spread rumors of China’s early arrival for rescue, but also teach Chinese martial arts on Okinawan soil. Chinese military intervention in the Ryūkyū question never took place and after the Japanese victory in the 1st Sino-Japanese War in 1895 the Ryūkyūan exile movement ceased to exist. 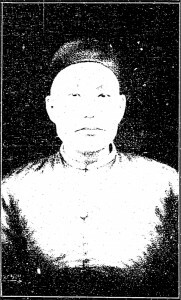 Tomigawa died in July 1890, aged 59 years, in Fuzhou. Many other exiles followed the same fate. Tomigawa’s “brother in arms,” Rin Seikō, in protest of Chinese non-action, killed himself with a sword in Beijing. This was the end of the Ryūkyūan royalists, the “phantom part” of some of the real old-style Ryūkyūan bushi. At the same time another group of Okinawans had established the pro-Japanese faction, supported by the Japanese government in their assimilation policy. At the center of this assimilation policy were the Shuri middle and normal schools, established in 1880. Among this group were many of those considered Shuri karate’s great masters (read Funakoshi’s autobiography to see how his parents and family reacted to his decision to fully comply to Japanese assimilation). These people were financially supported by the government. Stipends were continued to be paid until 1909!!!! Families of the exiles, however, were subject to economic sanctions. Already in the 1890s patriotic societies would form centered in the Shuri schools, praying and celebrating for Japan’s victory over China in the 1st Sino-Japanese War. Crew cut and military drill was quite fashionable at the time. The above things were key factors in the Okinawa assimilation policy implemented by the Meiji government. While among the exiles were many old-style karate men, including important members of the Kojō and the Yoshimura clans, this sort of old-style karate was wiped out during the assimilation era. And it is a reason for “phantom styles” of karate, which went underground and were finally dusted off by a targeted de-sinification. By the early 20th century, Okinawa was basically assimilated. There were not many ways around assimilation at the time. Some went to China, some elsewhere, some returned, and it is not completely clear whether they did it to evade the conscription valid in Okinawa since 1898, for economic reasons, or for political reasons. In this way, the old martial arts of Ryūkyū were ripped apart, fragmentary continued, and later put together again under the prerequisite of the Japanese idea of styles, uniforms, ranks, and ideologies. It was a policy that few, if any, of the masters could even recognize themselves. And there is a bitter truth hidden in this. This entry was posted in Unknown Ryukyu and tagged Chibana Chōshō, Fuzhou, Karate, Kochi Uekata, Kojo, Kojo-ryu, Kyan Chofu, Tomigawa Uēkata Seikei, Yoshimura. Bookmark the permalink.